The Federal Highway Administration has rolled out a new set of innovative technologies and processes under its Every Day Counts initiative that can help shorten the time needed to get highway projects finished and open to the public. For the next two years, FHWA will work with transportation agencies and the design and construction industries to deploy the 13 innovations, which range from construction management techniques to paving machinery that uses GPS technology to build higher-quality, longer-lasting roads. Every Day Counts, which began in 2010, is achieving significant results on the first round of technologies the initiative promoted. Every state transportation agency has applied one or more of the technologies, and many are now widely used. More than 40 states, for example, have used the Safety EdgeSM, a paving technique that tapers the roadway edge to allow drivers who drift off the road to return safely. Programmatic agreements, also part of the first round of Every Day Counts, establish streamlined approaches for handling routine environmental requirements. In EDC-2 some of the newly developed agreements will be applied in additional states or expanded to include regions. The emphasis will be on continuing to increase the efficiency and effectiveness of the highway development process while maintaining appropriate consideration of the environment. FHWA has developed a three-pronged strategy to help local public agencies navigate the complexities of the Federal-Aid Highway Program. These strategies for locally administered Federal-Aid projects include certification and qualification-type programs, indefinite delivery–indefinite quantity consultant contracts and stakeholder committees. Using these strategies can reduce the amount of oversight states need to provide and make it easier for local agencies to follow federal regulations and guidelines. Although 3D modeling technology has been widely used in other industries, its potential to increase productivity and efficiency in highway construction is just now being realized. GPS-enabled construction equipment, for exam-ple, can run all day and night with guidance from 3D model data and achieve accurate grades on the first pass, re-ducing waste and improving resource use. GRS-IBS technology uses layers of compacted granular fill and fabric sheets of geotextile reinforcement to provide bridge support. With 3D modeling software, project teams can connect virtually to collaborate on designs throughout the design and construction phases. Intelligent compaction can improve pavement quality and accelerate project delivery. Diverging diamond interchange design enhances safety by reducing conflict points on interchanges. Intelligent compaction is a modern approach to compaction of pavement materials, an important construction process that enhances pavement quality and performance. IC uses special vibratory rollers equipped with accelerometers, an integrated measurement system, GPS-based mapping and an onboard computer reporting system. Using IC can accelerate project delivery as well as improve quality. Accelerated bridge construction technologies allow highway agencies to replace bridges faster, more safely and sometimes at lower cost. Three ABC technologies being promoted under EDC-2 are prefabricated bridge elements and systems, in which structures or components are built off-site and moved into place in a matter of hours; slide-in bridge construction, in which a bridge is built next to an existing structure and slid into place after the old bridge is removed; and the geosynthetic reinforced soil integrated bridge system, which uses geosynthetic reinforcement and granular soils as a composite material to build enhanced abutments and approach embankments. The design-build project delivery method allows the design and construction phases of a project to be combined in one contract, which can dramatically accelerate project completion over the traditional design-bid-build process, in which design and construction occur sequentially. In design-build, a highway agency identifies what it wants constructed, accepts bids and selects a contractor to assume the risk and responsibility for both the design and construction phases. In the construction manager–general contractor process, the project owner hires a contractor to provide feedback during the design phase. Once the design phase is complete, the contractor and project owner negotiate a price for the construction contract. This process enables the contractor to offer suggestions during the design phase on innovation use and best practices and enables the project owner to make informed decisions on costs and scheduling. The use of alternative technical concepts gives contractors the opportunity to propose innovative, cost-effective solutions that are equal to or better than the state’s design and construction criteria. This contracting approach promotes competition and allows highway agencies to choose design and construction solutions that offer the best value. High-friction surface treatment is a pavement technology that dramatically reduces crashes, injuries and fatalities. It involves applying high-quality aggregate with friction values far exceeding conventional pavement friction to existing or potential high-crash areas to help motorists maintain better control in dry and wet driving conditions. Several innovative geometric intersection and interchange designs are now available that reduce or move crosso-ver, or conflict, points in intersections, increasing safety for motorists, pedestrians and bicyclists. Roundabouts, diverging diamond interchanges and intersections with displaced left-turns or variations on U-turns are among the alternatives to traditional designs EDC-2 is promoting. While most map-building applications at federal, state and local transportation agencies are housed internally, a new geospatial data collaboration initiative uses cloud-based geographic information system services to improve data sharing within agencies and among project delivery stakeholders. Collaborative analyses and rapid updating of shared maps will lead to faster consensus building and improved decision support. The EDC-2 quality environmental documentation initiative is designed to promote recommendations to improve the quality and reduce the size of National Environmental Policy Act documents developed for construction projects. The initiative will help make NEPA documents more effective in disclosing the information used in making project decisions to the public and participating agencies. That, in turn, will help project proponents accelerate project delivery and achieve better environmental outcomes. Crashes, disabled vehicles and road debris create unsafe driving conditions and cause about 25 percent of all traffic delays. A first responder training initiative will offer the first national, multidisciplinary traffic incident management process and training program. The initiative will promote shared understanding of the requirements for safe and quick clearance of traffic incidents, prompt and open communications, and motorist and responder safeguards. 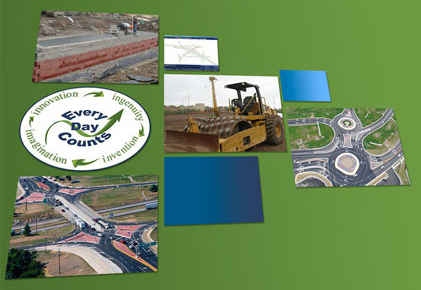 For more information on the EDC-2 initiatives and to view a Web conference, go to www.fhwa.dot.gov/innovation/everydaycounts/edc-2.cfm. Adaptive signal control technology that adjusts the timing of lights to actual traffic conditions is reducing congestion, fuel use and driver frustration in communities across the country. The innovative technology helps keep travelers moving by using real-time traffic information to determine which lights should be red and which should be green. It’s one of the technologies the Federal Highway Administration is promoting through Every Day Counts, its initiative to encourage widespread use of proven technologies that cut congestion and enhance safety. Adaptive signal control technology works by receiving and evaluating data from strategically placed traffic sensors and automatically updating the timing of traffic signals. It repeats the process every few minutes to keep traffic flowing smoothly. The traditional signal timing process, in contrast, uses manually collected traffic data and may only be repeated every three years or so. Traditional time-of-day signal timing plans don’t accommodate unpredictable traffic situations, such as special events or incidents. Adaptive signal control technology continuously updates signal timing to keep traffic moving smoothly. "Adaptive signal control technology shifts agency traffic operations from a reactive to proactive posture, effectively reducing the signal retiming process from three to five years to a matter of minutes," said Eddie Curtis, team leader for the Adaptive Signal Control Technology Initiative. "When properly applied, it has great potential to reduce traffic delays and emissions and improve safety." On average, adaptive signal control technology improves travel time by more than 10 percent. In areas with particularly outdated signal timing, the improvement can be 50 percent or more. Although adaptive signal control technology has been used in the United States for about 20 years, it has been deployed on less than 1 percent of existing traffic signals. Adaptive signal control technology projects are in various stages at 64 locations. Topeka, Kan., is one of the cities taking advantage of the technology. It installed new traffic signals equipped with cameras and processors on the 21st Street corridor. 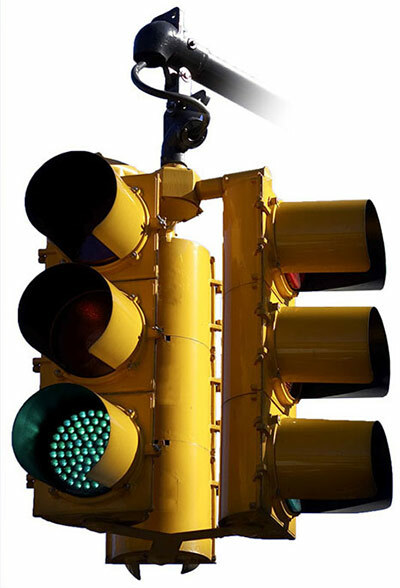 The signals communicate with each other to help coordinate traffic and limit waiting time at red lights. The system saves drivers on the corridor an estimated 123,000 gallons of gasoline and 191,000 pounds of CO2 a year. Crashes dropped by 30 percent during the system’s first year of operation. The city posted an online video, "Seven Traffic Signals in Two Minutes," to showcase how the technology improves the driving experience along the heavily traveled corridor (www.youtube.com/watch?v=yaGh3JsoQQU). The Alabama Department of Transportation is working with the city governments in Montgomery, Birmingham and Huntsville to implement adaptive signal control technology through experimental projects. The goal of the projects is to mainstream adaptive signal control technology statewide. Expected benefits include high cost-benefit ratios compared to traditional roadway construction, continuous and equitable distribution of green time among intersection points, reduced congestion and improved travel times. The city of Temecula, Calif., installed it at 83 intersections spanning 18 miles of roadway. As a result, drivers have enjoyed a 14 percent reduction in travel time, a 17 percent increase in corridor speed and a 29 percent reduction in stops. That translates to annual savings of about $2.6 million in travel time and $437,000 in fuel costs. The Florida Department of Transportation used it at 15 intersections on U.S. Route 19 in Pinellas County. A study showed a significant drop in travel time, with up to 25 percent reductions during a.m. and p.m. peak traffic periods. Using roadside environmental sensors, the agency found improvement in air quality parameters, including an 11 percent decline in carbon monoxide and a 17 percent drop in fine particulates. When the city of Gresham, Ore., implemented a system on the Burnside Road corridor, average travel times dropped during both weekdays and weekends. Citizen complaints related to signal timing shifted to compliments and requests to see the strategy expanded to other parts of the city. Sixteen adaptive signal control systems are available from companies in the United States. FHWA’s Resource Center offers technical assistance to state and local agencies evaluating whether adaptive signal control technology will meet their needs and capabilities. To help agencies navigate the process of implementing the technology, FHWA published Model Systems Engineering Documents for Adaptive Signal Control Technology Implementation (http://ops.fhwa.dot.gov/publications/fhwahop11027/mse_asct.pdf) (.pdf). For more information on adaptive signal control, including resources, training and more case studies, go to www.fhwa.dot.gov/innovation/everydaycounts/edc-1/asct.cfm. Choosing precast concrete pavement systems technology enabled the Virginia Department of Transportation to rehabilitate a heavily traveled stretch of Interstate 66 near Washington, D.C., with minimal traffic disruption. With the help of a Highways for LIFE demonstration project grant, the agency tried two types of PCPS on the project—precast prestressed concrete pavement panels and a proprietary jointed precast pavement system called Super-Slab®. PCPS technology involves casting panels off-site and installing them quickly during low-traffic times. As a result of the project, the agency learned that using PCPS can be an effective, cost-friendly alternative for high-traffic urban areas where cast-in-place concrete can be a challenge, according to a Federal Highway Administration report, Virginia I-66 Concrete Pavement Replacement Using Precast Concrete Pavement Systems. 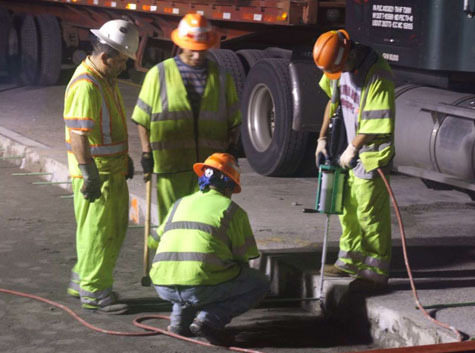 The project involved replacing deteriorated pavement on a section of I-66 in Fairfax County that carries 184,000 vehicles a day and a ramp to U.S. 50 that carries 28,000 vehicles a day. All construction was done at night during eight-hour work windows. The mainline section was repaired with two- or three-lane closures, while the ramp was fixed using full ramp closures and detours. Through the project, the Virginia DOT gained technical insights into two PCPS types and their installation procedures that can be incorporated into similar projects in states across the country. "Perhaps an important lesson easily overlooked from pilot projects is that, with careful planning and commitment to the undertaking, an agency can implement an innovative and proven technology successfully with minimal prior experience," the FHWA report noted. The project also demonstrated the value of good preparation and planning in achieving success, according to the report. Trial installations helped the Virginia DOT evaluate and become more comfortable with using PCPS technology. Planning for construction mobilization and scheduling the various construction activities were critical on a project with stringent construction time windows. The Virginia DOT used a unique contracting approach on the project, limiting the total contract value to $5 million and asking contractors to bid on required and optional repair areas. "When limited funding is available, it is possible to derive the highest value by selecting the contractor offering the largest scope during the bidding process," said the FHWA report. Crews worked at night to limit traffic disruption when they rehabilitated pavement on a busy Virginia interstate. Using precast concrete pavement systems technology allowed crews to install panels quickly during limited closures. No work zone crashes and one worker injury, not related to traffic, occurred during construction, so the project met the Highways for LIFE performance goals for safety. Choosing PCPS technology enabled the Virginia DOT to minimize traffic disruption and motorist interaction with construction activities, which enhanced traveler and worker safety. Using PCPS diminished the impact of construction congestion on the busy commuter corridor. Initial estimates suggested that, for the ramp segment of the project, using cast-in-place concrete would have required 100 or more days of construction with significant disruption to daytime traffic. Installing the panels during low-traffic periods at night allowed traffic to flow undisturbed by construction during peak travel hours. Before-and-after tests of smoothness and tire-pavement noise in the construction area found that the post-construction pavement was smoother and quieter, although it did not meet the Highways for LIFE performance goals. Innovation use saved the Virginia DOT $481,244 over conventional cast-in-place pavement construction. The savings came from reduced delay costs, improved performance and less need for future reconstruction, even though using PCPS panels for slab replacement made the initial construction cost marginally higher. The savings represent about 7 percent of the total project cost. To read the Virginia report and other technical reports on Highways for LIFE demonstration projects, go to www.fhwa.dot.gov/hfl/projects. When self-propelled modular transporters are used in bridge replacement projects, attention typically focuses on what happens: a transporter lifts a ready-made bridge and rolls it into place over the course of a few hours. For the Minnesota Department of Transportation, the more important consideration in using SPMTs for replacing the Maryland Avenue Bridge over Interstate 35 in St. Paul is what won’t happen—no extended construction phase, no intermittent lane closures and reroutes on the interstate, no months of congestion on adjacent neighborhood streets, and no long-term safety risks to construction workers. Several factors made the Maryland Avenue Bridge a prime candidate for the Minnesota DOT’s first SPMT project. Built in 1958, the 200-foot-long (61-meter-long), two-span bridge has been classified as structurally deficient and in need of replacement. Traffic safety and operations were also issues, with 366 crashes recorded at the interchange between 2007 and 2009. Then there was the high volume of traffic on both routes. I-35E is a major commuter road serving about 140,000 vehicles a day, while Maryland Avenue serves as one of St. Paul’s key east-west corridors with 20,000 daily travelers. And with several other crossings on this 8-mile (13-kilometer) stretch slated for replacement as part of the agency’s plan to widen the freeway and add high-occupancy toll lanes, the potential for delays, disruptions and safety problems on the area’s traffic network was quite real. Because the Minnesota DOT had no experience using SPMTs or other accelerated bridge construction methods, the agency applied for and received a $2 million Highways for LIFE grant from the Federal Highway Administration to help fund the cost of using innovative construction techniques. “The Maryland Avenue project was seen as a great opportunity to expedite delivery, minimize user delays, but most importantly gain valuable experience for both the agency and the region’s contractors,” said Emeka Ezekwemba, area engineer for FHWA’s Minnesota Division. Work on the $14.1 million project got underway in May 2012, leading up to the demolition of the existing bridge over the July 14 weekend. Three lanes of I-35E traffic were routed through the work area via the interchange ramps. By Monday morning, it was business as usual on the interstate, while Maryland Avenue’s traffic was routed to other crossings. The demolition started a 60-day window for the contractor, Lunda Construction of Rosemount, Minn., to replace the entire structure and reopen Maryland Avenue. A bridge farm was established near the final placement location to fabricate the new 210-foot-long (64-meter-long), 13-girder precast concrete superstructure. Concurrently, crews constructed the new bridge’s abutments and median piers. Plans called for the two-piece superstructure to be rolled in during an August weekend closure of I-35E, with all ramps and ancillary work scheduled to be completed shortly after. The Minnesota DOT estimated that using SPMTs would reduce Maryland Avenue closure time by 25 percent compared with a conventional construction approach. 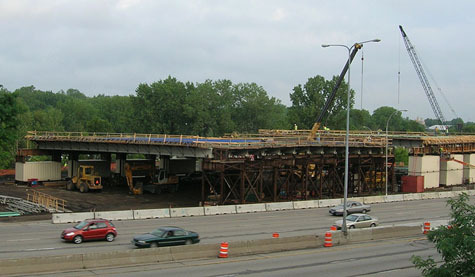 The Minnesota DOT adopted accelerated bridge construction techniques to speed construction and minimize traffic disruption on its Maryland Avenue Bridge project. In a preconstruction survey on the I-35E project, the construction project concern drivers mentioned most frequently was traffic delays, cited by about 30 percent of respondents. When asked about preferred construction scenarios, 76 percent said they preferred a temporary shutdown of the project area if it shortened overall construction time. Although the Maryland Avenue Bridge replacement was designed to cause less disruption for travelers, the agency implemented an extensive outreach program to educate the public about the new technology and other projects in the I-35E corridor. "Pre- and post-construction user satisfaction surveys will also assess how the public views the project, problems and successes with handling delays," Ezekwemba said. "We want to know how well we met expectations." Ezekwemba added that the benefits of the Maryland Avenue Bridge replacement will go beyond the project, particularly with the Minnesota DOT’s $2.5 billion effort to reduce the number of structurally deficient bridges in the state following the 2007 collapse of the I-35W Mississippi River Bridge. The state has more than 70 bridges to address by the program’s 2018 deadline. "That’s a lot of work, and a lot of potential impacts to motorists," Ezekwemba said. "The ability to use accelerated bridge construction techniques like SPMTs will be a big help in achieving our goals and keeping our customers happy." For more information on I-35E corridor projects, visit www.dot.state.mn.us/metro/projects/35estpaul. Peer-to-peer exchanges have emerged as an effective tool to disseminate information among industry and state transportation departments—and overcome barriers—on Every Day Counts initiatives. Typically, these exchanges are facilitated by teams from the Federal Highway Administration’s Resource Center. 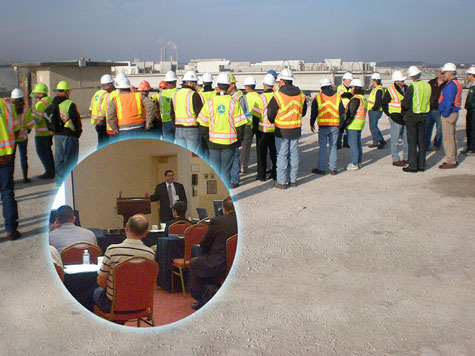 Peer exchanges have recently been held to advance such Every Day Counts initiatives as prefabricated bridge elements and systems and accelerated bridge construction, the construction manager–general contractor project delivery method, the design-build method, warm-mix asphalt, the Safety EdgeSM for pavements, and adaptive signal control technology. PBES peer exchanges have been held in Austin, Texas, Detroit, Mich., and Boston, Mass., said Benjamin Beerman, senior structural engineer at FHWA’s Resource Center. The center plans to complete five regional peer exchanges to cover the nation this year. "Then we can take reports from all of these regional exchanges and make one national report out of it—an overview of what is going on from a national perspective," said Beerman. "At each PBES peer exchange, bridge practitioners from state and local agencies, contractors, suppliers and academia share bridge practices in that region specific to PBES implementation,” Beerman said. "The gathering provides a forum to discuss the use of PBES in the areas of planning, engineering, materials, research, contracting and construction. The goal is to promote the benefits of PBES through education and application and seek opportunities to improve on methods used for implementation." Every Day Counts peer exchanges bring transportation professionals together to discuss strategies for implementing innovations. PBES are structural components of a bridge that are built away from or next to the site and installed in a short time period to reduce on-site construction time and disruption to the traveling public. Compared to conventional construction methods, PBES is faster and safer, lowers mobility impacts, can provide better quality and reduce cost, and is easily adaptable to many site conditions. At the Boston peer exchange, held July 31 to August 3, day one was a scan tour of bridge projects built using PBES and an owner-to-owner exchange that provided an overview of each highway agency’s PBES implementation status. Day two was Industry Day, an open session for presentations and attendance by suppliers, industry organizations, academia and state transportation departments. Day three was a design and construction exchange, at which project managers covered the design and construction aspects of specific PBES projects. And day four featured a roundtable discussion among owners. For the CM-GC initiative, an FHWA team assembled a peer exchange in Boston in May. CM-GC is an alternative delivery method that entails early contractor involvement in a project. "The purpose of these peer exchanges is to give states, contractors and consultants an opportunity to describe the benefits of using CM-GC," said John Haynes, FHWA transportation specialist. "We also want to provide technical assistance to states seeking to deploy CM-GC, such as those that don’t allow for it in their state legislation. "It makes sense to bring in the contractor during the design phase so the contractor can identify the risks, provide pricing information and optimize the schedule," said Haynes. "CM-GC also allows the contractor to begin tailoring the construction schedule during the design phase while the project’s needs are being developed." A series of eight exchanges on adaptive signal control technology was facilitated by Eddie Curtis and a team from FHWA’s Resource Center. Locations included Oakland, Calif., Champaign, Ill., and Lancaster, Pa. Adaptive signal control technology changes traffic signals in a real-time response to traffic volumes. A peer exchange and workshop was held in Vermont, headed up by Thomas Harman of FHWA’s Resource Center. Two technologies for warm-mix asphalt were demonstrated, along with the Safety Edge paving technique; intelligent compaction, which provides real-time measurement of asphalt mat stiffness; and the Pave IR bar, which records a thermal map of an asphalt mat in a computer directly behind the paver. A peer exchange on design-build, which combines a project’s design and construction phases in one contract, brought together transportation professionals from six New England states and New York. Held in New Hampshire, the exchange was facilitated by Jerry Blanding, innovative contracting engineer, and a team from FHWA’s Resource Center. Another exchange was scheduled for October 30–31 in Orlando, Fla.